For vapers looking for that full-flavor taste, we’re pleased to offer a line of drip tips for your vaporizer. 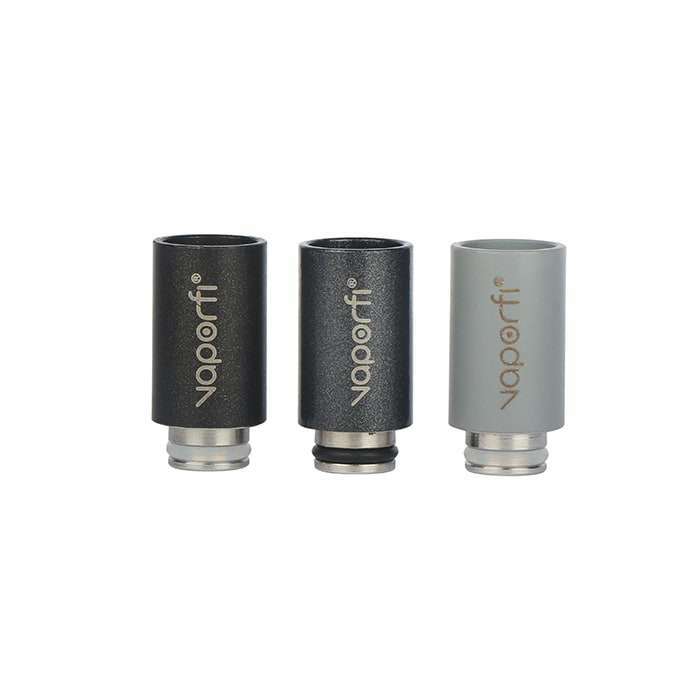 VaporFi drip tips are designed to provide deeper, fuller flavor without sacrificing comfort. As always, we know style is key. That’s why we’ve developed our line with high-end finishes like carbon fiber and swirled glass – so you can elevate your vape game without sacrificing performance. Shop our selection and find a drip tip in the color, style and type that suits you best. For many vapers, drip tips aren’t the first thing they think of when upgrading their vaping experience. However, considering the key role your drip tip plays in your vape, you might want to pay a bit more attention to it. Vape drip tips come in a variety of materials, so you can choose one to fit your personal style as well as your vaping preferences. At VaporFi, we are proud to offer customers a full selection of custom drip tips with premium finishes and smart designs, thoughtfully crafted to be the best in the industry. Drip Tip Material: What’s the Difference? You can choose from carbon fiber, wood, plastic, metal, marble, rubber, and glass drip tips – all of which have a different look and style. And while adding a unique drip tip to your personal vape device can be an impressive way to show off your style, the material isn’t just for looks – each one has a specialized functionality as well. 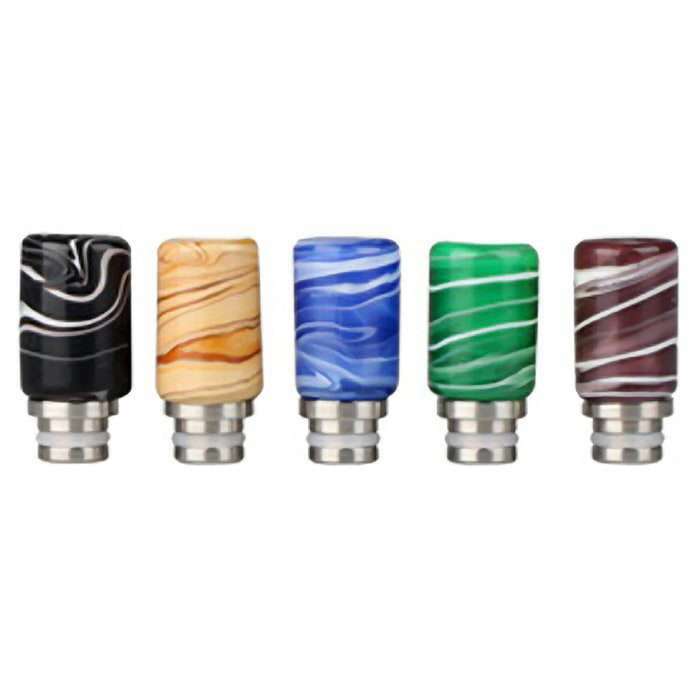 It is important to understand that each type of drip tip materials has its pros and cons, so that you can make an informed decision and choose the best fit for you. Metal drip tips can come in a variety of alloys, ranging from stainless steel to titanium. A big plus of a metal drip tip is that it is typically corrosion-resistant, so it has a long life. Avoid metals like copper or brass, because these cheaply made drip tips will (literally) leave a bad taste in your mouth. Glass drip tips provide excellent heat resistance, which is especially important if you run a sub-ohm tank or RDA. You will be able to enjoy the comfort of a cool drip tip, but you will need to be a bit more careful with this one. It is glass, after all! Plastic drip tips are among the most common, with Teflon (just like your non-stick pans) being a top choice. It is a relatively inexpensive, versatile material that fits just about any vaping setup. Wood drip tips are unquestionably one of the most stylistic options, with the distinctive graining giving your device a refined look. Luckily, wood is functional as well – because it has natural insulation properties, it keeps your lips cool. Carbon fiber is as stylish as it is durable, providing you with a drip tip that won’t degrade over time. This high-tech option is also lightweight. Ceramic tips offer an impressive resistance to corrosion, heat, chemical, and electricity, making them an excellent option for many vapers. However, if you chose a highly-polished ceramic, you should be aware that your tip can gunk up very quickly if you don’t wipe it down regularly. Ceramic tips can be broken if you aren’t careful, and their slightly higher price tag can deter some vapers. Rubber drip tips are flexible, with silicone being the perfect material for vapers who prefer a soft and comfortable option. For the VaporFi team, it’s impossible to pick just one favorite drip tip from our selection. For the minimalistic vaper, we have simple but functional designs like the VaporFi Non-Stick Drip Tip or our three-pack of VaporFi Rubber Drip Tips. If you’re looking to add a touch of style to your vape device, we have plenty of drip tips that look like miniature works of art. Check out the VaporFi Glass Art Drip Tip (Wide Bore), the VaporFi Glass Swirl Drip Tip (Wide Bore), or the VaporFi Tall Artistic Drip Tip for unique designs that will add that special flair. For something classic, the VaporFi Wood Drip Tip is an unbeatable option. At VaporFi, it doesn’t matter if you spend five or five hundred dollars – we firmly believe you deserve the best, regardless of your budget. That’s why we offer a range of high-quality options at all price points. All of our products, whether they are our original brand or another top name, are carefully selected for quality, durability, and performance. Quality isn’t the only benefit to shopping with us – VaporFi makes it easy for customers to save money and earn free stuff simply by signing up for our free loyalty rewards program. Earn points on all your VaporFi brand purchases, and then use those points towards awesome free products. Plus, we have easy auto-ship and subscription services that make it convenient to receive all your favorite vaping products exactly when you need them. Our 30-day money back guarantee also means that you can shop with zero risk – if you don’t like your purchase, we will refund 100 percent of your money. We are committed to offering this because, at VaporFi, we want to ensure that all of our customers enjoy shopping with us.